This would actually be a useful skill if by “Pepper” we were referencing Iron Man’s Pepper Potts. Having a bit of pull over a super hero seems like a useful tool to have in your back pocket 😉 . With these treats, I opted to go even more “super” crazy and make them gluten free (although feel free to use regular flour if that’s what you’ve got, it will totally work as well). As is my usual wont, these cookies came about partly to use up some leftover red wine. I had a half bottle left that I didn’t want to have go to waste (I know, I know, I could just drink it of course, but the wine itself was just so-so, so I was hoping to use it up in baking instead). The other reason I opted for them was that I’ve had these German pfeffernusse cookies – which are essentially black pepper spice cookies that are traditionally made around the holidays (and will thus possibly make an appearance on my Christmas cookie roster this year) – on my list of things to make since before last Christmas. 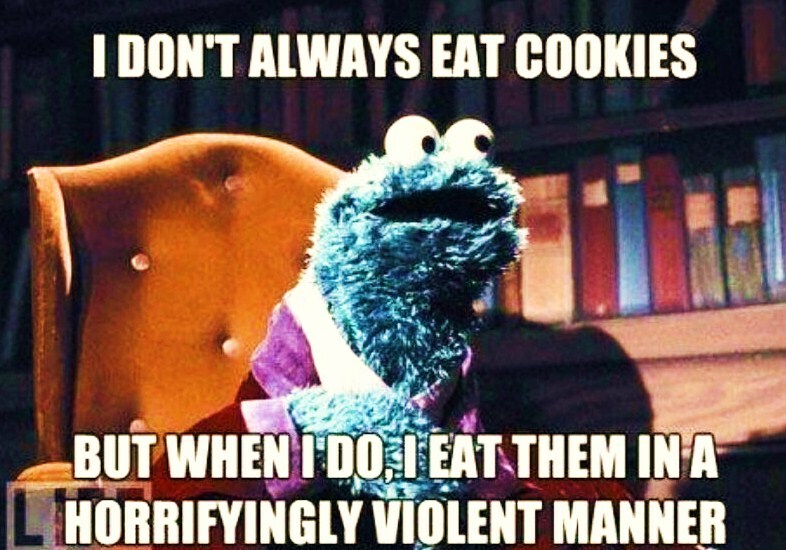 …ummm…also, I bake so many cookies that I apparently turn into one when I start drinking. Makes me pretty fun and popular at parties…until people go to bed and realize their beds are all full of crumbs after I made the rounds. Just call me Ernie and you can be Bert and start yelling at me for my messiness while I ignore you completely and continue in my cookie crumbing ways 😉 . Oh Sesame Street, are there any life lessons you can’t teach us? 😉 Anyway, enough wine-ing, lets get on to the business of making and consuming said Pepper wine cookies! In a small bowl combine non-dairy milk with lemon juice and allow to sit for at least 10 minutes. Preheat oven to 350F and line a couple of baking sheets with silpat or parchment paper. In a medium sized bowl, sift together flour, cornstarch, baking powder, baking soda and salt. In a large bowl, whisk together brown sugar, butter, coconut oil, vegan “buttermilk” (aka your non-dairy milk lemon juice mixture that you’ve set aside), egg replacer, and vanilla until smooth and well combined. Stir the dry ingredients into the wet ingredients using a mixing spoon (try not to overmix). Using either a small cookie scoop or a tablespoon, scoop batter into small mounds on your baking sheet. They don’t really spread out much when baking, so an inch or two between each cookie should be more than enough. Bake for 12-15 minutes, or until cookies spring back slightly when touched. Allow to cool while making the red wine filling. In a medium sized bowl, beat together the butter, melted white chocolate, cream cheese, vanilla and salt. In a small bowl,sift together icing sugar, coconut milk powder, cardamon and cloves. Slowly add to the wet ingredients mixing to combine. Place red wine in the microwave, or in a small saucepan on the stove and heat until reduced slightly. Beat this thickened/ concentrated “wine syrup” into bowl. Add more icing sugar if still too thin to be spreadable as a cookie filling. As more wine or non-dairy milk if it’s too thick. In a small bowl, stir together cane sugar, cloves, salt and cinnamon. Spread filling thickly between 2 cookies and roll the edges in sugar mixture.